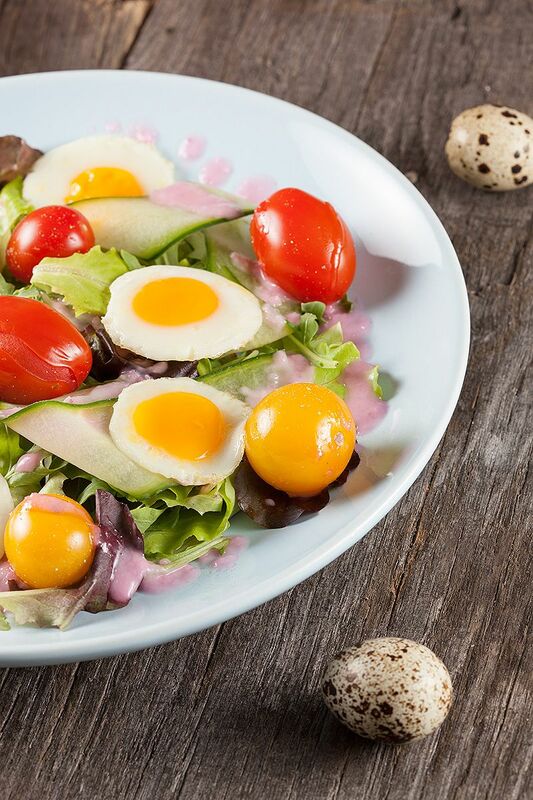 Pretty tiny quail egg salad, so delicious, so summery and ready in 15 minutes! Red onion dressing gives that extra kick, absolute divine. PRE-HEAT the oven to 150 degrees celsius or 300 degrees fahrenheit. RINSE the cherry tomatoes with cold running water and place them in an oven dish. DRIZZLE with olive oil, pepper and salt. SLICE up a garlic clove and add to the oven dish if you like. PLACE them in the oven for about 10 minutes. PEEL the red onions and chop them in chunks, suitable for your blender. ADD white wine vinegar and blend until smooth. Slowly add the sunflower oil and bring the red onion dressing to taste using pepper and salt. 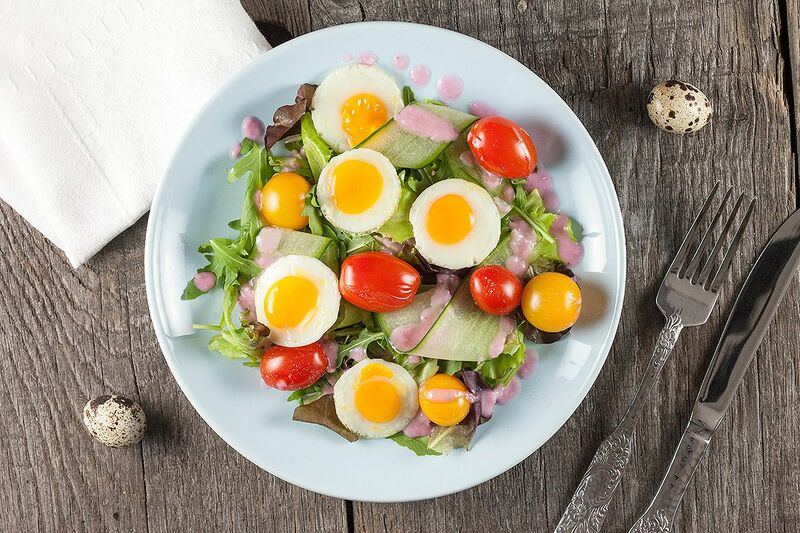 OPEN up the quail eggs using a pairing knife and fry them for 2 minutes on medium low heat. We’ve used a poffertjes pan, so the eggs will be beautiful round but you can use any pan you like. DIVIDE the mixed greens over 2 plates. Use a vegetable peeler to create cucumber strips and divide over the mixed greens. 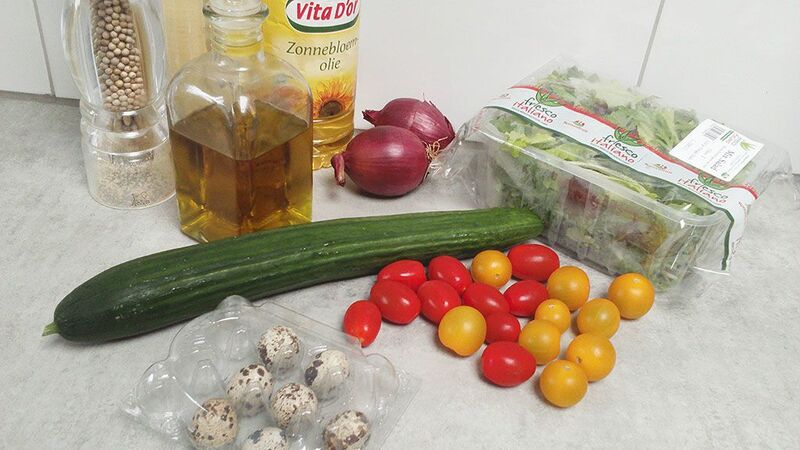 DIVIDE the fried quail eggs and cherry tomatoes, without the garlic pieces. 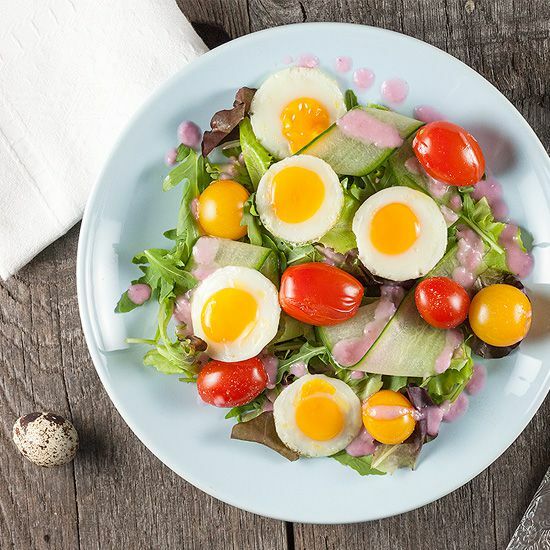 DRIZZLE with the red onion dressing and use some extra salt and pepper on the eggs. Enjoy your meal!